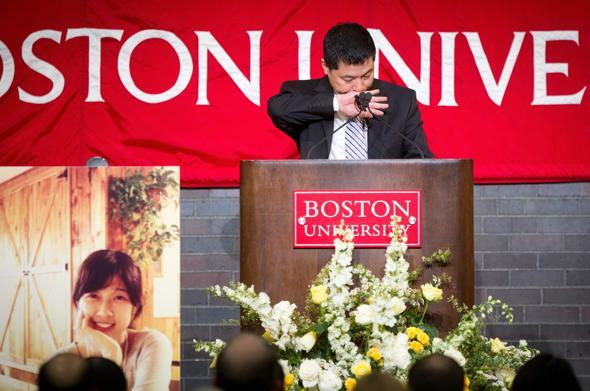 The family of Chinese graduate student Lu Lingzi, 23, attended a memorial service at Boston University for their daughter, who was killed in the Boston Marathon attack. Hundreds of people, including state Governor Deval Patrick, joined Lu Lingzi’s father and her aunt who had travelled from Shenyang, China, to repatriate their daughter’s remains. “She’s gone but our memories of her are very much alive,” said her father, Lu Jun, who spoke in his native tongue and was followed by an English interpreter. Lu Lingzi was the family’s only child.